We reserved our stay based on Good Sam recommendation. Explained when made reservation that we must have access for satellite dish. They insisted that they could accommodate us. When arrived, their selected site was awful & they had no alternate. Trees blocked satellite access. Our trailer was no more than 7 feet from our neighbors' trailers. Did get our money back but had to move on without a reservation. Campground is very crowded. Great campground with wonderful staff. We submitted a water issue in the morning and it was fixed that same morning! Many things for kids to do within a very safe environment. They had a music group one night for oldies rock n roll - great fun. Convenient to everything in Gettysburg. Highly recommend this campground. This is one of the best campgrounds we've stayed at! Friendly staff -- and very helpful in providing information & suggestions on the many, many things to see and do in Gettysburg. Friends stayed in cabin that was very clean. Restrooms very clean. Gettysburg only a few miles away, but far enough away so you are not caught up in all the traffic in and around the town Campsites provide a good amount of shade and decent size and level. A great variety of activities going on if you wish to participate. RV repair on site that we took advantage of -- VERY competitive rates - and fixed right the first time -- wish we had at every campground! What a wonderful camping experience! Gettysburg Campground is one of the nicest I have ever visited. Large sites, very well maintained, friendly and efficient staff, so much to do, Putt-putt golf, shuffleboard, karaoke night, and more. Super clean restrooms and pool area. And close enough to the battlefield to hear the cannons going off! I would not hesitate to go back again. Staff wonderful and helpful with information. Restrooms very clean and sites were well kept. Can't wait for our next trip back to Gettysburg because 2 days were not enough. Traveled with 11&13 yr olds and they loved it as much as much as we did. Large campground close to the Gettysburg Battlefield and other amenities. We were here for Elvis Weekend and they had lots of Elvis activities including an Elvis impersonator on Saturday night. Great campground. Friendly staff too. Terrible 2 nights at this campground. For some unknown reason, our 36' Class A was placed in two spaces reserved for either TT or pop ups. We had to maneuver between trees, move picnic tables and fire rings (old tire rims) to even get close to the hook ups. Because of the way we were parked we could not sit outside because of being so close to the TT next to us with smokers and the cigarette smoke choked us back inside. Why we were not put in the Class A lot is unknown to me. If there was no room, they should not have accepted our reservation which was made weeks in advance! Never again! This was our very first outing with our 5th wheeler and we could not have been more pleased with the beautiful, well maintained campground! The friendly and helpful staff were first rate and there seemed to always be someone readily available to help right away. 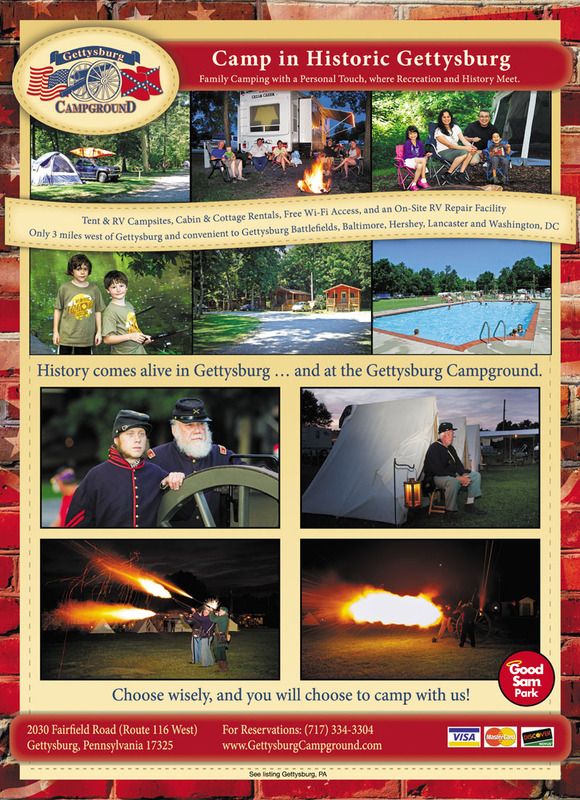 We look forward to spending time again at Gettysburg Campground! We had a nice site overlooking the stream. The staff were friendly and helpfull. The campground is very close to town and all the sightseeing and shopping and restaurants. We had a great time in the Gettysburg Campground. The owner was very "hands on", accomodating and friendly. Also great recommendation for dinner at The Dobbin House. We have visited Gettysburg Campground for 11 years, two three day weekends a month. The pool is always full! There is Mini Golf, Shuffle board, crafts for children/adults, a band on Saturday nights, hay rides, in season baked goods from a bakery, and fresh vegetables. They also sell Hershey Ice Cream! We've had pull in and back in sites We like having a slot on the main road, across from the playground (when grand kids are with us). Management is very friendly and helpful. We asked the owner to let us know if/when a main road site became available (because we were at the back of the campground). The owner called us and said he had a site on the main road, so he changed the sites for us. Management makes sure quiet time starts at 11:00 pm sharp. Only 10 minutes to a grocery store, about 12 minutes to the center of Gettysburg and close to fruit stands. It's very family oriented. Yeah, it's our favorite campground.! I can't say enough, this is a top notch facility. Friendly staff, clean bathhouse and real close to everything in Gettysburg. There is also a RV repair dealer near by (not connected to campgrounds). Great place to stay! Enjoy the best family friendly park in Historic Gettysburg! 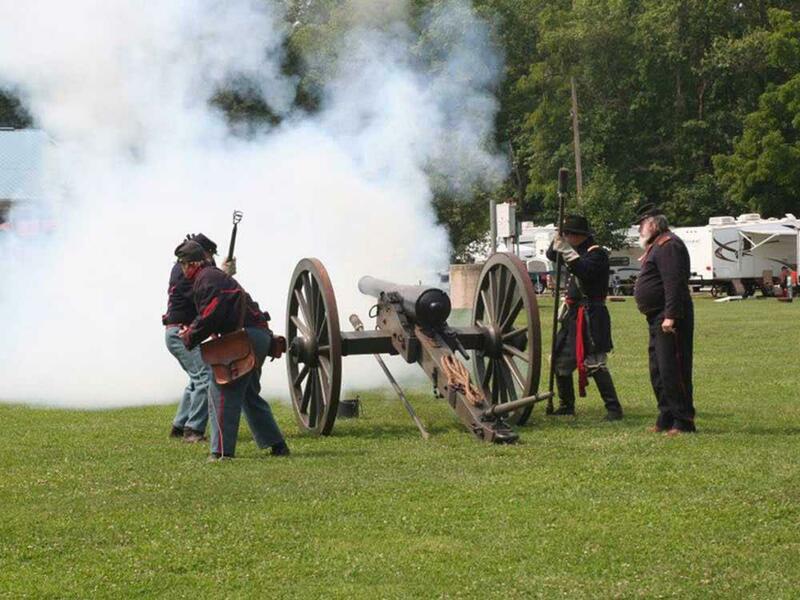 After a day filled with touring the battlefield, enjoy all of the great activities at our park, especially the newly designed pool, mini-golf, fishing in our stream, peddle carts, and relaxing by a beautiful evening fire. Gettysburg National Park will bring to life the story of the fight between the North & South during the Civil War. Visit the place where President Lincoln gave his Gettysburg address to reunite the country again.